A good turn out this month with lots of modelling taking place. Firstly a photo of various models, Nigel Cliffe's fine scaled 04, Nick Mitchell's LMS vented van(2mm Assoc. body kit), two chassis and Nick's LMS Van (N Gauge Society body). 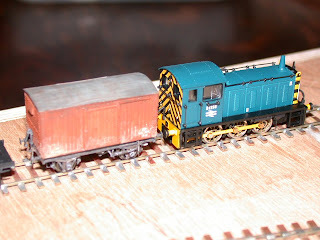 In the foreground is a Peco N-6.5 wagon on Microtrain wheels. 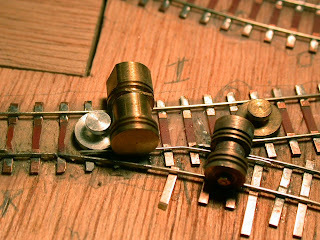 A close up of the 04 and Nick's LMS vented van shows what can be achieved in 2mm, firstly by fitting fine scale wheels to a Farish 04 loco, see the 24 March 2008 blog for further information. Secondly by a well painted 2mm Association body kit on an Assoc. chassis. This picture shows Nick hard at work on a Chriss Higgs etched chassis which is being prepared to fit under the N Gauge Society LMS van body seen in the top photograph. This beautifully curved handbuilt point is by David S for his layout based on Goathland station on the North Yorkshire Moors Railway. 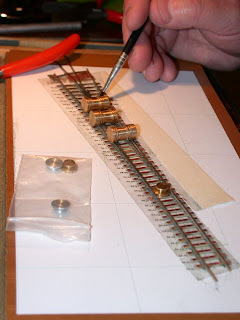 Here you can see four track gauges being used to hold one of the switch rails to gauge prior to the soldering iron being applied. 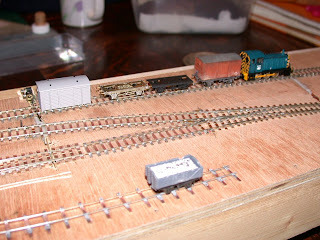 This layout is one which is being prepared for the Golden Jubilee Challenge. More information about the Challenge can be found at the 2mm Scale Association's web site and also other blogs, links to the right of this item. 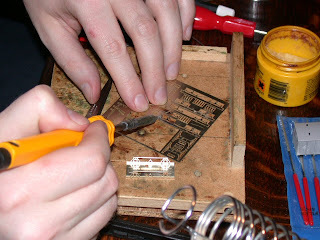 Nigel spent the evening carefully cutting out a card building side onto which he stuck the photo reduced, 4mm scale to 2mm scale, building paper. Here we see the window/door chads being pushed back into place to hold the paper folded over into the reveals, whilst the adhesive dries. The final photograph shows my progress on laying in some narrow gauge track to Marks Quay, here working on the point where the dual gauge track diverges into separate tracks. The roller gauge to the right was an Association 9.42mm track gauge but I shortened it in the lathe by first drilling a hole right through to take a 12BA bolt, then parting the gauge off in the middle and reducing its length until it was 6.5mm gauge. The bolt then holds it together. It would have been easier had I planned this at the start of the layout instead of some time after all the standard gauge track was already laid. Never mind I feel it will be worth it in the end. 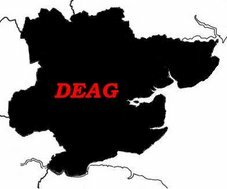 Details of the next meeting can be found to the right, or on the 2mm Scale Association website calender.